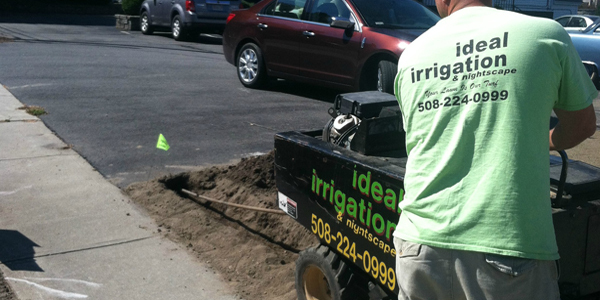 Ideal Irrigation is your number one underground service provider! Access area you never thought you could reach for irrigation, lighting and plumbing needs. No damage to existing conditions. Under any and all materials; concrete, masonry, asphalt, etc. Plumbers; Sleeves, utilities, gas feed, outdoor showers, etc. Electricians; Lamppost runs, powers to sheds, pool feeds and spigots, wire, cable, etc. We can pull any pipe material at any depth with vertical no damage to the work area. Ideal horizontal drilling allows access to areas you never thought you could reach for irrigation, lighting and plumbing needs. No damage to existing conditions. We are based on the south shore currently servicing both Commercial & Residential properties all over Massachusetts/ The Islands as well as New Hampshire and Rhode Island.